The new method could lead to a deeper understanding of how bees communicate location and space through their waggle dance. TORONTO, Monday, July 16, 2018 – A new food reward test has found that foraging honeybees are better at remembering where to find nectar, than younger nurse bees, and it has to do with behaviour, not age, a study out of York University has found. This test could lead to a better understanding of the honeybee’s remarkable ability to learn and communicate spatial information. Worker honeybees are nurse bees for the first two weeks of life and look after the young brood before becoming foragers in search of pollen and nectar. “We found that nurses and foragers learn the same, but foragers are able to remember the location of the rewarding flower better than nurses,” said York University biology Associate Professor Amro Zayed, who led the study with PhD Candidate Nadejda Tsvetkov. Tsvetkov designed the new test following a suggestion by York psychology Associate Professor Suzanne MacDonald, a co-author on the paper, to try a search task paradigm similar to what she uses to study animal behaviour. “As researchers, we often rely on established methods because it takes a long time to develop a new test. But if we have new test, we can come up with new experiments that allow us to answer questions we couldn’t ask before,” said Tsvetkov. The tests for measuring spatial learning that existed before were not only very cumbersome, they took a long time to perform and it wasn’t possible to test a lot of bees. “The biggest innovation here was the development of this test that allows researchers to quickly study hundreds of bees in a controlled environment to see how they learn about space. It’s pretty low tech, but it’s quick, it’s effective,” said Zayed. 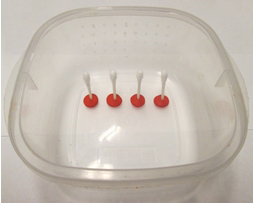 For the study, 236 nurses and foragers were individually put into containers with four artificial flowers (Q-Tips), only one of which had sugar water on it. After establishing that foragers had better recall skills, the researchers decided to see if that was because they were older bees or if it had to do with behaviour. The researchers also used a drug – cyclic guanosine monophosphate (cGMP) – to put young bees into a “forager” state of mind and found that these bees were also better at remembering the location of the rewarding flower. Behaviour was the defining factor in the better memory skills of foragers, not age. Next, the researchers are going to use this test to help understand if there’s a genetic component to how bees learn about space and remember spatial information. The research was published in the journal Insectes Sociaux. York University is known for championing new ways of thinking that drive teaching and research excellence. Our students receive the education they need to create big ideas that make an impact on the world. Meaningful and sometimes unexpected careers result from cross-discipline programming, innovative course design and diverse experiential learning opportunities. York students and graduates push limits, achieve goals and find solutions to the world’s most pressing social challenges, empowered by a strong community that opens minds. York U is an internationally recognized research university – our 11 faculties and 26 research centres have partnerships with 200+ leading universities worldwide. Located in Toronto, York is the third largest university in Canada, with a strong community of 53,000 students, 7,000 faculty and administrative staff, and more than 300,000 alumni. York U's fully bilingual Glendon campus is home to Southern Ontario's Centre of Excellence for French Language and Bilingual Postsecondary Education.